Happy New Year 2019! I know New Year’s Day was a week ago, but we’ve kept the celebration going all week. 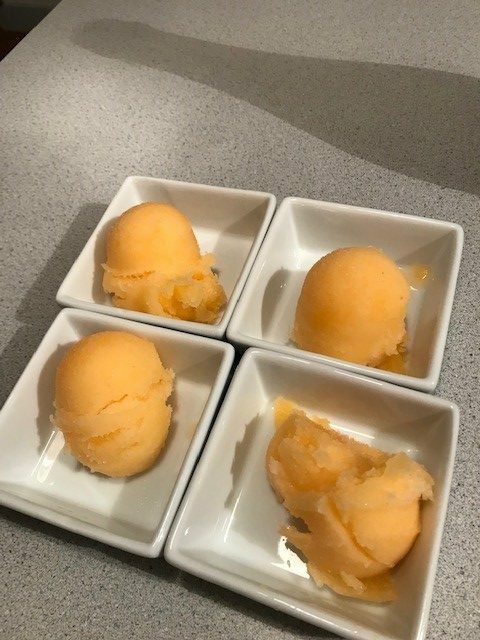 This year’s first recipe for Cook the Book Fridays is a perfect seasonal dessert to start the year: Tangerine-Champagne Sorbet. And it’s simple too, just three ingredients. First there’s citrus. In this case it’s sweet clementines, my favorite citrus. Next, a little bit of sugar. Finally, there’s champagne. 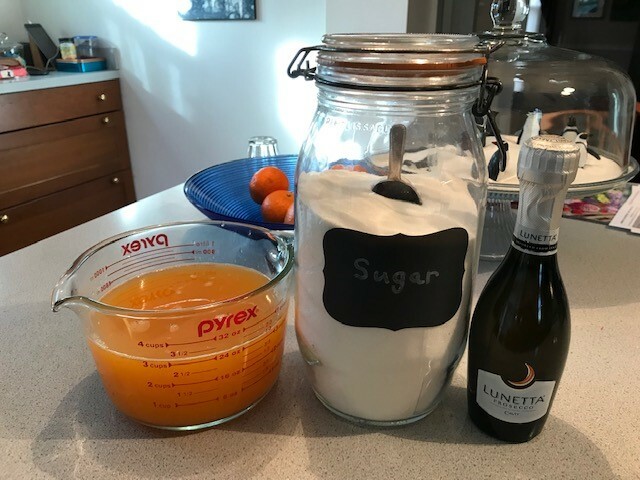 We didn’t have any leftover bubbly from New Year’s Eve, but I had splits of prosecco on hand. One little bottle was almost the right amount. I waffled between making up the difference with still white wine (flavor) or seltzer (bubbles). In the end, I chose the wine since I didn’t expect the bubbles to survive the freezing. 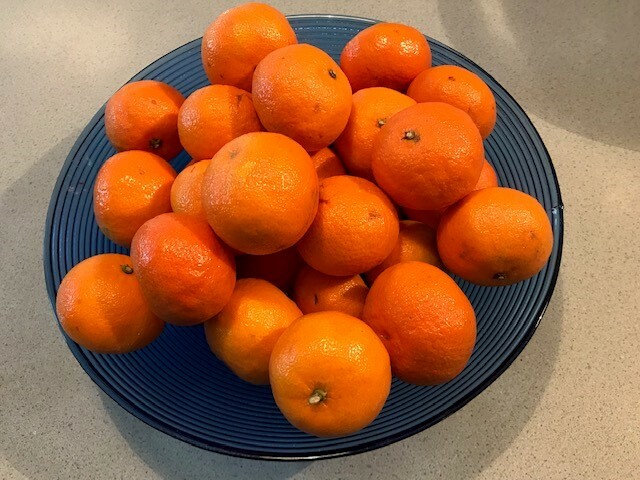 The most time-consuming (active) step in this recipe is juicing the clementines, four pounds of them. And then there was the waiting time, for the mixture to chill and then after freezing it in the ice cream maker, letting it firm up in the freezer, but that’s easy. None of that takes away from the simplicity of this sorbet. We enjoyed this refreshing dessert after going out to dinner with friends for a belated New Year’s celebratory dinner of spicy Chinese food. It was PERFECT! So, the year in my kitchen is off to a delicious start! I hope it continues! And I hope your year is a tasty one too! If you want to make this yourself, you can find the recipe on page 317 of David Lebovitz’s My Paris Kitchen. And you can find my friends’ opinions on this tasty treat here. 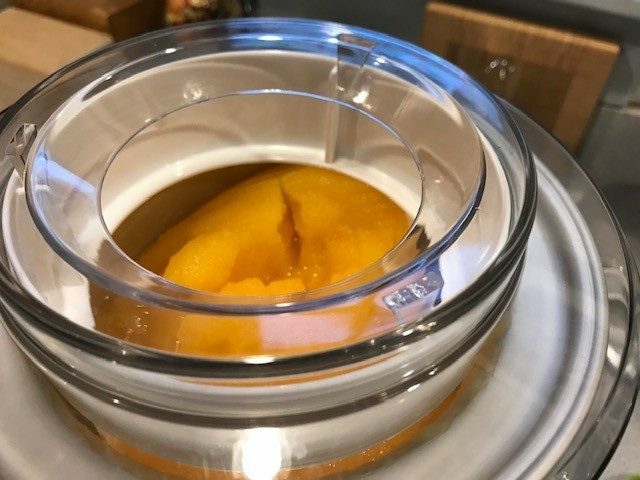 Posted on 6 January 2019, in Cook The Book Fridays, dessert, my paris kitchen, Winter and tagged citrus, Cook The Book Fridays, my paris kitchen, sorbet. Bookmark the permalink. 3 Comments. Yes, there is a lot of juicing involved. A lot of love placed and just as much in return. This is a big crowd pleaser. I served twelve together with some vanilla ice cream and the peel. Everyone’s happy and jolly. A very good start of the year, indeed. Since I didn’t use an ice cream machine mine sorbet is not s smooth as yours. However, the flavors were perfect, and the results were so refreshing. Happy New Year Betsy.